Smoking tobacco cigarettes has such negative impact on the lungs and rest of the body. Now SolarCigarette.com has given their clients a chance to smoke their electronic cigarette while getting a small dose of Coenzyme Q10 while using their vitamin packs. The Solar Cigarette has given smokers a new of smoking that is much more preferable by both smokers and non smokers. One of the reasons why this unique smoking alternative is becoming so popular is because it allows smokers to smoke anywhere they like without passing down second hand smoke to others in the area. Since this is an electronic cigarette there is no smoke or smell which is a huge benefit for everyone and not just smokers. Now these same smokers are improving their way of life by using the Coenzyme Q10 vitamin packs that SolarCigarette.com has introduced to their clients. Coenzyme Q10 is also known as vitamin Q which smokers will inhale with every puff of their Solar Cigarette. Not only is the smoker satisfying their nicotine cravings, they are also getting a small dose of vitamin Q that will help with weight loss and the anti aging process. "Coenzyme Q10, also known as CoQ10 or Vitamin Q, is one of the most promising tools in the anti-aging arsenal. Research has proven that CoQ10 benefits include playing a role in the treatment and prevention of a host of age-related disorders." 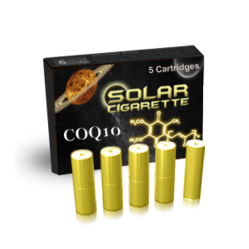 A representative of SolarCigarette.com states that these Coenzyme Q10 vitamin packs are just one of the many beneficial vitamin packs Solar Cigarette has in its arsenal of different flavors but this is just one of the many vitamin packs that improve wellness as well. Solar Cigarette also offers Vitamin B and ginseng vitamin packs to help promote wellness which has been a huge hit with our clients.